The fifth pattern in Miss Lambert’s My Knitting Book is for Muffatees in Two Colours. The first question that jumped to mind was what, exactly, are muffatees? 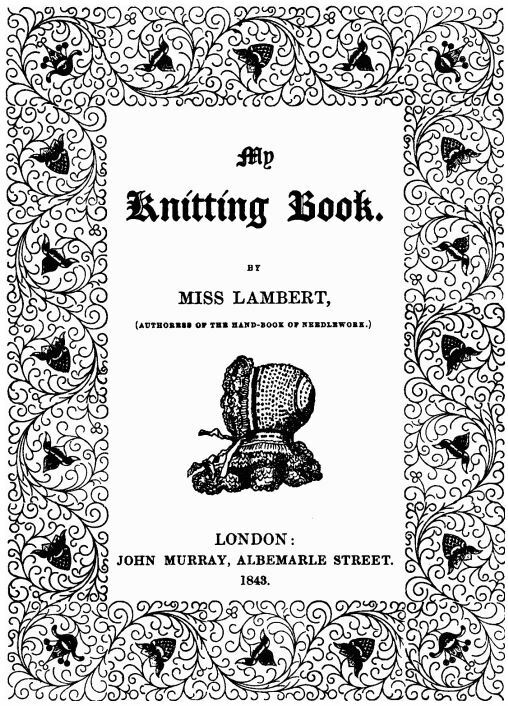 Miss Lambert does not provide an image of the finished muffatees in her book or details on how to complete them, beyond knitting to the desired length. According to the Glossary of 18th Century Costume Terminology, muffatees are “like mitts, but cover the forearms only, and not any part of the hands” but, the term may have been used to also include mitts and mittens as well as other forms of hand coverage. 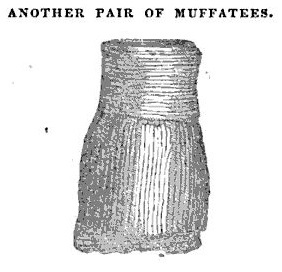 On the blog Dances With Wolves, the post entitled What the heck are muffatees? describes muffatees as a being “tube-like, fingerless mitts that cover wrist and hand up to the middle of the fingers, usually with an opening along the side for the thumb.” Muffatees were meant to provide an extra layer of warmth both indoors and outdoors. The post, Muffatees Please, on the Beaver Creek Traders blog describes muffatees as fingerless mittens that allowed for warm hands and free fingers. 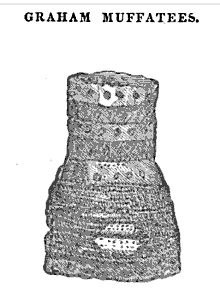 In The Workwoman’s Guide (1840), the muffatee patterns include instructions to leave a hole for the thumb when they are sewn up. Muffatees were hand warmers or wrist warmers or arm warmers which may or may not have had a thumb hole. It seems that there is a range of definitions of the term muffatees! Interestingly, the pattern for the Graham Muffatees shown above is the exact pattern provided for the Very Pretty Cuffs in Miss Lambert’s My Knitting Book (see my previous post). I wish I had made this connection earlier! It seems terms ‘cuff’ and ‘muffatee’ were interchangeable, at least as far as Miss Lambert was concerned.